Ashcroft® Type 600A-04 thermometers are remote mounted instruments that provide performance while being highly resistant to shock and vibration. They are extremely versatile for use on many applications. Usually used with a thermowell, the Duratemp® is ideal for applications with vibration and very high or low temperature. 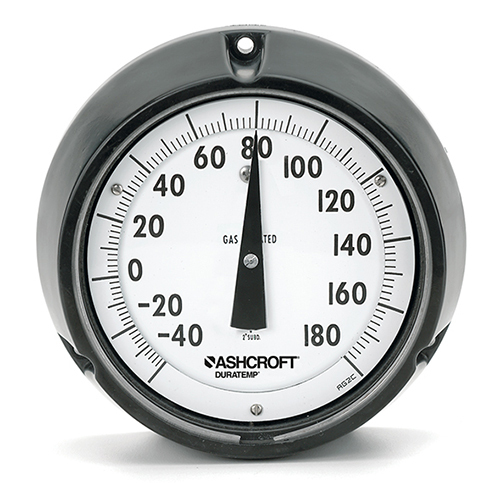 Ashcroft® Type 600A-02 thermometers are panel mounted instruments that provide performance while being highly resistant to shock and vibration. They are extremely versatile for use on many applications. Usually used with a thermowell, the Duratemp® is ideal for applications with vibration and very high or low temperature. Weksler® Type 333B, 433B, 633B, and 833B adjustable angle gas actuated dial thermometers have uniformly graduated scales, an adjustable pointer and fast response. Their inert gas fill makes them ideal for applications where Mercury is prohibited. Ashcroft® Type 1005 pressure gauges are commonly used on compressors, filter regulators, fluid power equipment, medical equipment, pool and spa filters, automotive diagnostic equipment, beverage dispensing equipment, industrial machinery and a variety of other applications.